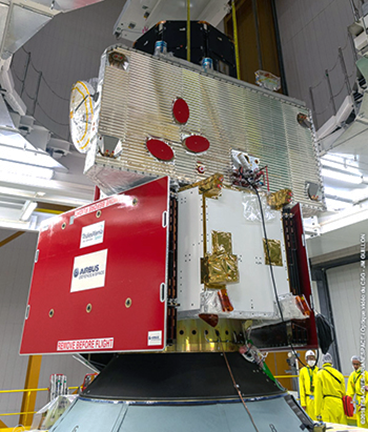 This week’s Arianespce Ariane 5 flight that will send BepiColombo on its way to the planet Mercury has been approved for liftoff on October 19, following the launch readiness review held at Europe’s Spaceport in French Guiana. With approval granted, Ariane 5 is cleared for rollout tomorrow from the Final Assembly Building to the ELA-3 launch zone. 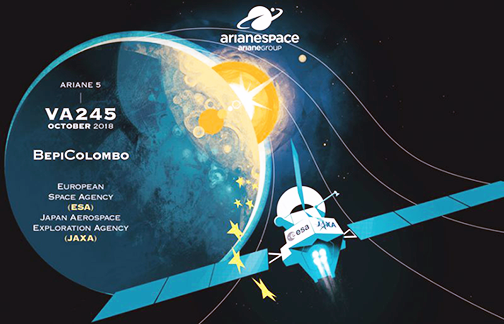 Designated Flight VA245 in Arianespace’s numbering system, the launch will deploy its BepiColombo passenger during a 26-minute sequence — with liftoff set for a precise moment on October 19: 10:45:28, local time in French Guiana. Additionally, Arianespace will launch the National Advanced Optical System (NAOS) under the term of a turnkey contract between OHB Italia and the Luxembourg’s Directorate of Defence. Using a Vega C or Vega rocket, the EO mission will be conducted from the Guiana Space Center in Kourou, French Guiana, in 2022. Built by OHB Italia, NAOS will weigh approximately 600 kg. at launch and is designed to have a nominal service life of at least seven years, once positioned in SSO at around 500 km. Vega C and Vega are part of the Arianespace’s family of launch vehicles, alongside the heavy-lift Ariane 5 and the medium-lift Soyuz, operated from the Guiana Space Center. Avio, based in Colleferro Italy, is the industrial prime contractor for Vega and Vega C.
Following the signature of this contract, Mr. Roberto Aceti, Managing director at OHB Italia, said that the company is delighted to contribute to the realization of the Luxembourg Earth Observation system with the firm's NAOS satellite. With the signature of this launch contract, the company confirms Arianespace as OHB's traditional and reliable partner for launching the firm's satellites, after the success of OPTSAT-3000 and the upcoming PRISMA. Mr. Stéphane Israël, CEO of Arianespace, added that Arianespace is delighted that OHB Italia entrusted the Vega system to orbit NAOS, an advanced observation satellite for the Grand Duchy of Luxembourg. By launching this new satellite fully owned by the Luxembourg’s Government, Arianespace is proud to help enhance the country’s capacities in space to the benefit of citizens and the NATO alliance. This contract proves once again the competitiveness of the Vega offer toward the small satellites market and Arianespace capacity to ensure a reliable and competitive access to space for European partners.